CRC-Evans provides specialist equipment and services to the pipeline industry, providing a unique combination of leading-edge technology and in-depth experience to bring efficiencies to pipeline construction. The CRC-Evans team is highly trained in the planning and delivery of specialist equipment and services to pipeline projects around the world, at spool base locations, conventional offshore lay barges and onshore pipeline construction. CRC-Evans offers a wide range of both manual and automated welding systems, which are built to offer ease of operation and continuous production. The fleet of equipment includes weld pre-heat coils, internal lineup clamps, pipe facing machines, power units, automated and manual welding bugs. Automated welding systems provide high repeatability and quality in a high production environment. Skilled supervisors and technicians are available to support field activities in the use of manual, semi-automatic and mechanized welding processes to assist clients in pipeline construction and fabrication. They are also experienced in the use of PGMAW, STT, GTAW and GSFCAW, as well as all material grades, including carbon steel to X120, stainless steel, Inconel clad, duplex, super duplex, titanium and 13% chrome. CRC-Evans has a full function welding facility in Invergordon, Scotland, to carry out welder training, procedure development, as well as research and development for both manual and automated welding techniques. Pipeline Induction Heat (PIH) is a specialist field joint coating contractor for the application of a wide range of anti-corrosion, thermal insulation and profile in-fill solutions. The systems applied include heat shrink sleeves, fusion bonded epoxy, PP and PE flame spray, three-layer spirally wound PP, PU foam infill, injection-moulded polyurethane and injection-moulded polypropylene. The equipment and services offered by PIH are designed specifically to the project and the customers’ needs, to ensure efficiencies in the installation of the specified field joint coating systems, as part of offshore pipeline construction. The principles adopted by PIH are to utilize automated equipment and processes, which offer speed and repeatable quality for the application of advanced field joint coating materials to the welded joint area. Specialist technicians and engineers bring unrivalled experience to the specialist services and will work closely with the contractor to optimize cycle times and efficiencies in the firing-line, either on the lay barge (J-Lay and S-Lay) or at onshore fabrication or spool base locations. PIH also offers custom coating services for the application of anti-corrosion and thermal insulation systems to fittings, spools and bends. 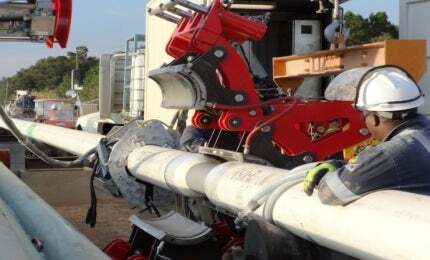 CRC-Evans offers a range of pipeline equipment, including its high-performance Centurion bending machine, pneumatic wedge mandrel and TruBend™ wireless angle measurement instrument. These components work together to give increased bending speed and productivity over standard systems. CRC-Evans offers storage racks, roller systems and other pipe handling equipment needed for fabrication, spooling and loading of rigid pipelines before installation. STANLEY Inspection has grown into a worldwide leader in providing specialist inspection, non-destructive testing and heat treatment services. The services include the latest equipment and technologies available, supported by experienced technicians. CRC-Evans will assist with pre-qualification trials and testing, as well as the preparation of any project-related documentation (operating procedures, inspection and test reports, HSE project plans, etc). CRC-Evans is currently operating in over 25 countries worldwide, with major offices located in Holland, the Middle East, South Africa, Malaysia, the UK and US.